Dave, wonderful work on the conversion and the paintjob, but as soon as you put Carmicheal's markings on it, you lost it IMO. Too obvious. Far too obvious. Korean Sea Furies ALWAYS have his markings on them and there's plenty of other options out there instead. RAN, for example as they flew Sea Furies in Korea. Final bit of modelling for 2016 - correct a fundamental schoolboy decaling error (not evident from the photos)plus add the underwing rocket rails and rockets. 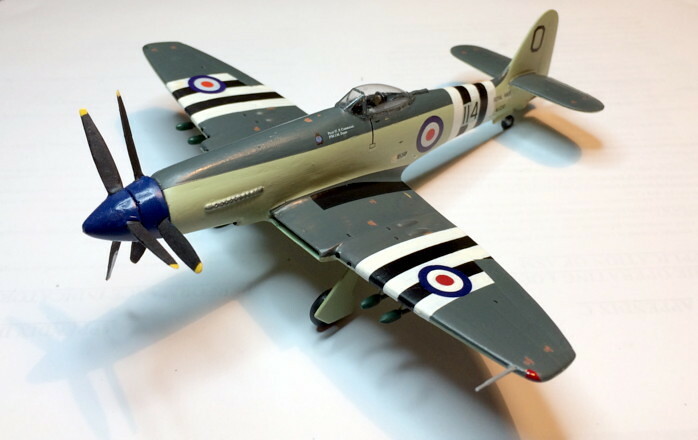 Pics in due course and will try and remember to put it next to my built Sea Fury; there's quite a different feel to 'my' P1032' - IMHO it's much sleeker and faster looking than the Sea Fury. Don't get me wrong, Sea Furies are amongst my favourite aircraft and they do possess a pugnacious elegance. I absolutely love this bird ! I'm with you there cap'n. It's a year since I said it but I still maintain it looks like a Wyvern with good posture.